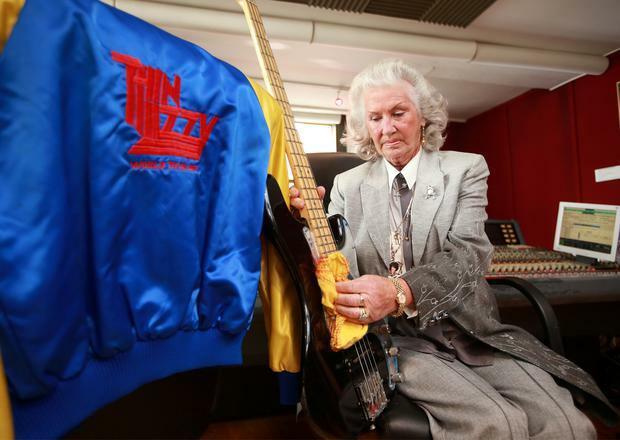 Philomena Lynott, mother of late rock star Phil, has found "peace of mind" after donating several of her son's bass guitars to the Irish Rock and Roll Museum Experience in Dublin's Temple Bar. Philomena nearly lost the precious items in 2013 when her Sutton home was burgled on her 83rd birthday. "I didn't care what the burglars took as long they didn't get Philip's guitars," Lynott told the Irish Independent. "Since then, all the things have been minded by a special friend. It gives me peace of mind to know they are here." Since her son's death in 1986, Philomena has been approached several times regarding the possibility of auctioning the guitars. "I was never tempted to sell or auction them. God no," she said. "I wanted them to be in a museum because Philip is so special and his music is so special. I wanted fans to be able to see them." Philomena has donated three of Lynott's guitars, four of his satin and leather jackets, and a dog-earred school report from Lynott's days at the Christian Brothers in Crumlin. According to the report, the 'Whiskey in the Jar' singer was an accomplished mathematician but his knowledge of the Irish language left a lot to be desired. The museum runs in conjunction with the Temple Bar Recording Studios - the venue where Lynott recorded some of his final material.